Ken Wagner fielded questions and concerns from School Committee Chairs across the State. Rhode Island school committee chairs held a lively discussion with the new Commissioner of Education, Ken Wagner, at a recent meeting hosted by RIASC. 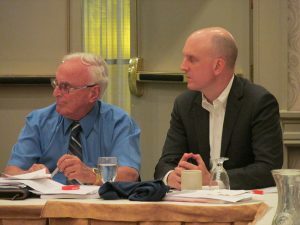 The Commissioner listened attentively and took notes as school committee chairs and RIASC Board members posed questions and raised concerns on topics including PARCC Testing, the opt-out movement, shared services, and high school graduation requirements. RIASC hosts quarterly chair meetings for their members as part of their ongoing professional development program, RIASC’s Leadership Academy.